Fruit Fiesta is a unique and now very popular online progressive slot machine developed by Microgaming - the leader in online casino systems. 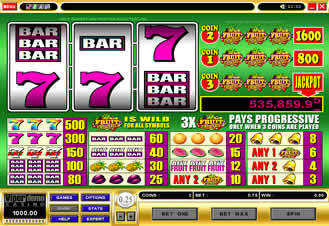 The slot has a Wild symbol and a large number of winning combinations (20) besides progressive jackpot. Fruit Fiesta is a popular game and some 5-digit jackpots are won every month. Fruit Fiesta is a 3-reel, three coin, three pay line progressive slot machine that is now available in 5-reel version (see image below) with enhanced number of winning opportunities on every spin. It is connected to multiple casinos powered by Microgaming's advanced casino systems. Fruit Fiesta accumulates deposits from it's players at all participating online casinos and creates large jackpots. It is important to play the maximum number of coins (3 coins or $.75 per spin on the 3 reel game) on every spin to win a jackpot. Note that $.75 is one of the lowest price for a chance to win a large progressive jackpot. 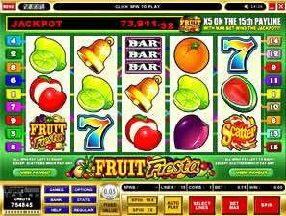 Fruit Fiesta is available at large number of Microgaming online casinos. However, we would recommend you join Jackpot City, that is offering a $2000 bonus to any player who hits a jackpot of any size while playing their progressives. All new players receive $50 free cash (or 50 Euros, or 50 Pounds). Check out over 70 Fruit Fiesta winners stories and interviews. See real winner photos and advice for players. Note: dozens of Fruit Fiesta players win progressive jackpots each month.